Turmeric is a plant of the ginger family, native to the warm climates of South Asia. It is a common ingredient in Eastern food dishes and has been widely used in ayurvedic medicine for cuts, burns and bruises. 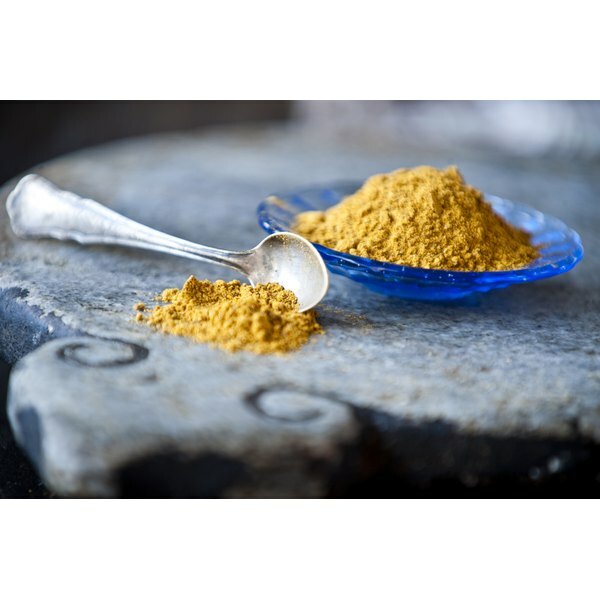 Scientific studies show that turmeric may help improve health conditions. However, the advice of a medical professional should be sought before trying to prevent, treat or cure any condition with turmeric. Turmeric may help people suffering from Alzheimer’s disease. A study published in February 2009 in “Pharmacology, Biochemistry and Behavior” found that the curcuminoids, the active ingredients in turmeric, lead to memory improvements in rats. Specifically, the rats had an easier time remembering the correct path of a water maze. Colon cancer is the fourth most prevalent type of cancer in men and women, according to the findings of a study published in April 2010 in the “World Journal of Gastrointestinal Oncology.” Turmeric works against colorectal cancer by enhancing the body’s innate immune abilities. For example, turmeric supports processes of the immune system that are responsible for stopping the proliferation of colorectal cancer cells and killing tumor cells. Cholangiocarcinoma is a type of cancer of the bile ducts that drain bile from the liver into the small intestines. Turmeric may help improve the prognosis of patients with cholangiocarcinoma. In a study published in 2009 in “Parasitology Research,” turmeric was found to help improve bile functioning in hamsters with cholangiocarcinoma. Turmeric worked by reducing inflammation, which helped the bile ducts to constrict properly, thereby improving bile flow. Turmeric may help people suffering from muscle soreness. A study published in 2010 in the “British Journal of Sports Medicine” tested the effects of turmeric applied to sore muscles after exercise. The researchers found that participants had less swelling and pain. Turmeric worked by reducing inflammation in the body, which, in turn, leads to the reduction of pain. Parasitology Research; Turmeric Reduces Inflammatory Cells in Hamster Opisthorchiasis; Sirintip Boonjaraspinyo et al.